Saint-Gobain Fiber Glass Insect Screens for Windows and Doors — Hyderabad India: Welltech Systems is India’s leading manufacturer and distributor of insect screens and insect screen systems to keep flying insects (mosquitoes) out while allowing fresh air to circulate around the rooms. That’s not all, the insect screens and insect screen systems also filters pollution such as tiny dust particles. Insect Screening is mainly used on windows and doors to protect against insects especially mosquitoes and acts against attracting dust. Also it is used for star hotels, hospitals,educational institutes,villas, apartments,independent houses and industrial purposes, sieves, filters and others. Our insect screens are available in fiberglass, aluminum and stainless steel. aluminium profile frames in BC brown, golden brown and white colors which are durable, washable and easy to maintain. It keeps the surfaces clean and bacteria free,anti fungus and enhances your business image with fly free environment. Drain away water to protect from Mosquito bites, Hyderabad. Beautiful Picture of Mosquito in Dirty Water.. But Save children’s from Malaria, Dengue, Chikungunya, Brain Fever, Filariasis an other diseases. It our and everybody’s responsibility to drain away water in and around our homes to protect ourselves from these dangerous diseases. Tuflex India’s Authorised Distributor and Stockist – Welltech Systems, Hyderabad, Andhra Pradesh. 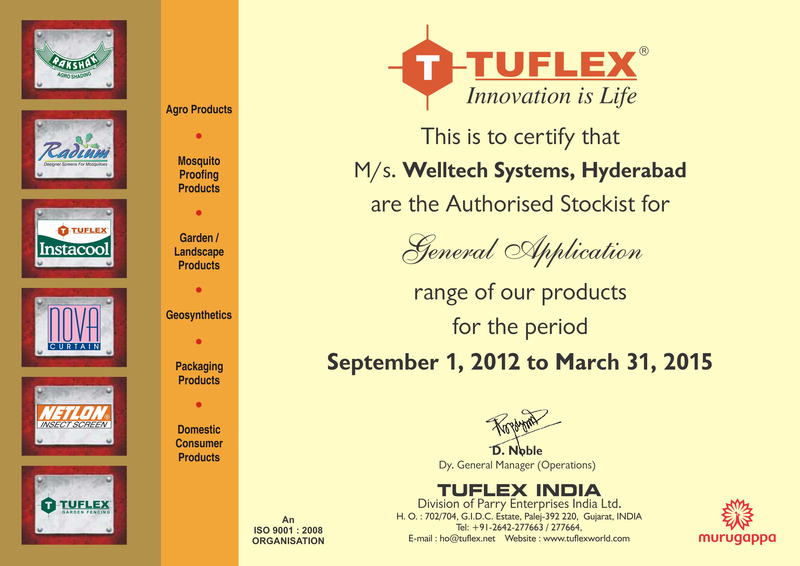 Welltech Systems, Hyderabad, Authorized Distributor and Stockist for Tuflex, India. 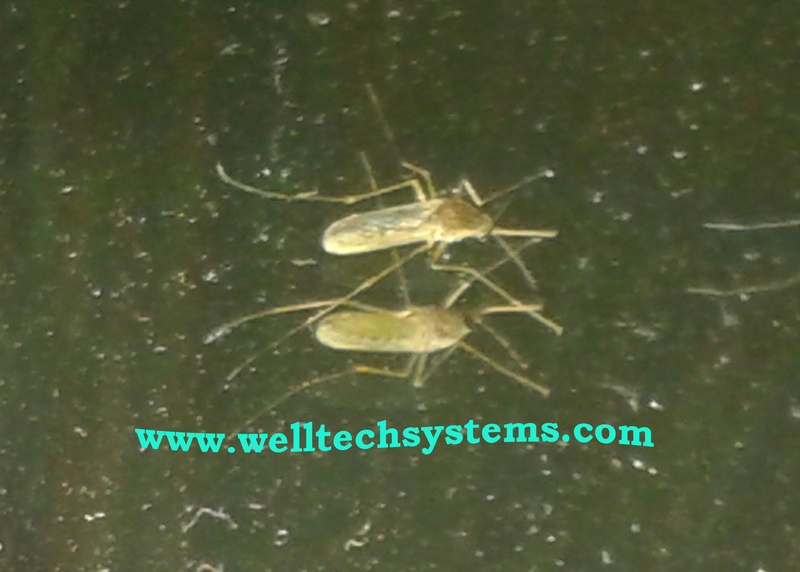 Welltech Systems, Hyderabad, Andhra Pradesh is a India’s leading manufacturer and distributor of Insect Screens and Insect Screen Systems to keep flying insects and mosquitoes out of your home or office, while allowing fresh air to circulate around the rooms. Welltech Systems develops structural designs that are versatile, robust, fire and corrosion resistant which are easily cleanable with nice and elegant screens systems that are custom made for windows, doors, balconies and other outdoor openings. The main products we make are: – Mosquito Meshtypes that come in Fiber Glass, Aluminum and Stainless Steel. The Aluminum profile types that come in Sleek Window Frames, Roller Screens, Pleated Screens and Openable Doors which are Powder Coated for Aluminum Channels. Welltech Systems, Fabricates Aluminum Channels for sliding windows and doors, office partitions, bath room doors with solid PVC sheet. The advantage of using aluminum is for its lightweight, strength, corrosion resistance, durability, attractive appearance and easy maintenance. Welletch Systems, Hyderabad, Andhra Pradesh is an authorized distributor and stockist of mosquito mesh, mosquito screens, mosquito mesh from Tuflex, India. Tuflex India offer complete range of mosquito screens, mosquito mesh, mosquito nets by any manufacturer in the world. These are exclusively designed exactly as per the requirements of clients. Tuflex innovatively designed and manufactured insect screen helps to provide a mosquito free home to all. These insect screens are available in trendy and attractive colors to suit the varied tastes. Mosquito Screens totally prevents the entry of mosquitoes, reptiles and other insects through windows and doors. Tuflex India are manufactures and exports in the widest range of world class products in the field of polymer nets, knitted fabric and allied products. Earlier known as Netlon India, a division of Parry Enterprises India Ltd. and part of the highly diversified Murugappa group of companies. Tuflex India has a strong presence in various fields like geotechnical engineering, mosquito proofing, agro shading, garden fencing, packaging and various domestic products. Tuflex high quality standards makes products amongst the best in the world.Through a very strong market oriented approach, continuous innovation and consistent focus on quality, achieved leadership in almost all the areas. Tuflex offers, valued clients the advantages of superior time tested quality products and greater value for the money spent and has gained vast experience and deep understanding of the Indian conditions to adapt international developments to country’s specific needs. Tuflex India’s product range includes a wide range of Designer Insect Screens such as Designer Insect Screen, Designed Insect Screens, Designed Insect Screen, Design Insect Screen, Insect Screen, Design Insect Screens and many more items.